how to create and amazing resume letterhead (part 3) | Career Counseling for Your Career Bliss | make. believe. for real. If you’re just joining this series specifically on resumes, click here. She wasn’t absolutely sure. Just almost absolutely sure. What she was trying to do was “the right thing” to get the jobs she really wanted. But it wasn’t working. She got jobs, but not the jobs she really wanted. And never the one that she really, really wanted. Her solution was to then try even harder to “do the right things” in her application and as a result her resume was written in key words, which meant that it didn’t sound like a human being had written it even though there was not a single typo to be found. The harder Rebecca tried to get it right, the further away she seemed to drift from work that felt like a right fit. By the time we met, she was frustrated and hardly recognized herself anymore throughout the job procuring process. Rebecca was taught that if you play by the rules, you’ll get the job you want. The thing is that by trying to follow the rules of the application process so strictly she was missing out on the opportunities to reveal her real self in the [white] space that did exist. This was puzzling to her because she believed that she had learned the formula to a good resume and since she knew it all, what else was there to do? I explained to her that what she had actually learned was the formula to acquire a sense of job security at the expense of a sense of the freedom to be who she was at work. It’s the difference between being a success and genuinely feeling like a successful human being. It worked like this: Rebecca learned how to create job applications in university when she was feeling insecure about her future job prospects. In this circumstance she acquired the understanding that she needed to be passive in her learning about how to create a resume because she was promised a method ‘proven’ to appeal to employers. What she didn’t acquire was the ability to see herself professionally as a real person in order to assess the right employment prospects for herself. Ideally you’re creating your resume in a space of preparation and self-determination for what’s next rather than when “what’s next” is looming and ominous. In a passive approach to learning about resume creation you’re usually shown sample resumes that are “tried, tested, and true.” Though in my mind, those applications have a “been there, done that” quality to them because, like the people that they represent, the results of those applications don’t have you uniquely in mind. What you actually need to do is evolve from what you’ve been shown as the “worthwhile samples” which isn’t a message you can understand when you’re feeling uncertain and looking for a job to satiate fears around security. As you might have suspected then, this means that employers mostly receive applications that look and sound roughtly the same. It’s almost “too easy” to apply for any ol’ job these days. Rebecca heard me out, but was concerned about the “databases” that she would be putting her application into that were programmed to identify the right “key words.” By expressing this concern, I could see that her skepticism hadn’t subsided. While she liked the idea of what I was saying, she felt that in execution it seemed to disadvantage rather than advantage her. I assured her that I believed very strongly in honoring industry norms, but that it’s also important to understand that norms create “boxes” that you ultimately decide how to play with and in. Within those boxes is space after all, and if there is space then there is freedom. To address her concern about having all the right key words, I clarified that what she wanted was to “search engine optimize” her resume for the company databases. I explained that, first and foremost, the content of her resume needed to be written true to her being. Beforehand identify the key words that you think you need to have (make a list of them and put them aside until you’re done writing your resume for you). When you’re resume content is mostly decided, take out the list of key words and place them mindfully rather than forcing them into the content. Your final copy should have just the “right dusting” of keywords throughout without compromising the person you are. What Rebecca found was that she used the keywords she needed naturally in the resume bullets rather than writing with them, and only them, in the forefront of her mind. Writing with the keywords as her highest priority had actually served to make the act of creating resume bullets painful and very awkward to represent in person. What Rebecca realized she had been doing that made her feel so uncomfortable was to try to appear like everyone else while hoping against hope that she would get selected from “a stack of resumes” because it was “her turn” to get picked. Her resume was plain, and it needed to be to a certain extent, but it didn’t also need to be boring. Using two font styles as well as mindfully positioning the name of the role she was applying to was really different for her, but with her newfound understanding, Rebecca agreed that these two things were acceptable to her industry. Creating a resume isn’t about making it look better than other applicants. It’s about making it look like something that represents you. Something you’re content and peaceful about submitting. Rebecca’s realizations from our conversation made her stop trying to appear competent by sounding like every other person in her profession. She decided that her education and work history showed that she had the quantity of experience so she was able to decide to focus on the quality of the resume content. For example, as an Engineer, Rebecca constantly looks at things that are problems and puzzles. Her approach is analytical, methodical, and logistical in nature. These qualities are expected of an engineer she told me. 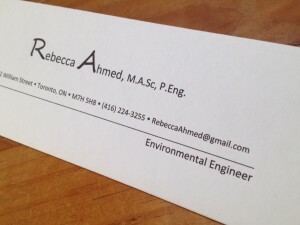 So, in her simple header design that still matched her industry’s standards, Rebecca made sure that her resume letterhead looked like her solutions – “elegant” and “approachable.” She used these two words to guide the look and feel and approach in her application while still meeting expected norms. With her new resume Rebecca succeeded in landing a job that she said was “perfect” for her. Her boss and her saw their work in similar ways and complimented each other in their differences. Rebecca didn’t know she could experience that kind of symbiosis with another person in her work because she had tended towards working on her own thing in her own way never considering herself very good at collaboration. But then something happened. Within a year, her department went through a dramatic restructuring. She knew that was likely going to be the case when she accepted the job, but no one could say what that really meant in practical terms when she was hired. Her boss, who she really respected and cared about, was reallocated to another part of the organization and Rebecca’s job was changed with her still in it. And this is how jobs aren’t unlike romantic relationships. We get into them and they’re one way and then sometimes something happens which changes them dramatically. The change couldn’t necessarily have been foreseen and Rebecca was treating herself like she could have and should have known how it would all unfold. We blame ourselves for thinking we should have know how things will turn out. We can’t know everything. We can only know how we’ll treat ourselves in the process. The good news was that Rebecca now understood that she didn’t need to hide who she was on paper to get a job she wanted. The bad news was that now she was seeing that the job she was in wasn’t what she wanted. Again. 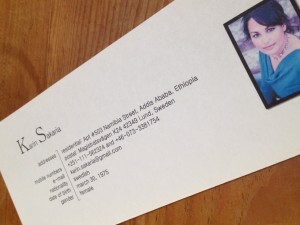 Karin’s resume is an example of an international design. Her and I had been working together for a few years by the time we started talking about her resume. She had been doing management jobs for various international organizations for several years up to then. They were long-term, but always project work because funding was added or cancelled depending on global events, politics, and the priorities of the international community. There seemed to always be a job for her and that’s partly because she was often working collaboratively and keeping her colleagues informed of what she was up to. She was the key point person for the projects that she managed … and the ideal networker. Given this, you might think it strange that Karin wanted to work on her resume with me. I know I did. But once we began to talk about it, I understood what she was struggling with. Ultimately she wanted to evolve herself – how she talked about and saw herself on paper – to take the next step on her career path. But she didn’t know quite how to do this for herself as she could only see and write about herself in “management” terms. Add to this the fact that international organizations have very particular protocols for bringing people into “the fold” and they have within them structures that are more hierarchical (than a domestic corporate office in the Western world) because the nature of the work is security based (to relate if this feels at all un-relatable, think about if your work was in the business of securing society in the case of a pending war, recovering from war, taking action in a natural disaster, a terrorist attack and such as your everyday). Karin, as a result of both the breadth and specificity of her experience, was a very sought after person because her application communicated a great understanding, reverence, and meticulousness regarding security issues. Karin, however, was ready to grow and take on leadership capacities in the organizations that she had her eye on. So she struggled, like most people do, with only knowing how to see and speak about herself in a particular way on her resume with the added wrinkle of writing in English, which wasn’t her mother tongue. And as in Rebecca’s case, Karin’s application had to adhere to strict guidelines. Perhaps even more so. So the dilemma of the resume writer is this: You have a format that represents “the old you” but you need to write about yourself in a way that makes it possible for you, not just others, to believe that you are ready for the next level of responsibility in an organization that operates as though they already know who and what you are. You need to write about “the you” that you are who hasn’t quite yet materialized. So often we carry discomfort around within about who we are an who we are meant to be as though those two people have nothing in common. Many people get into one type of job and end up moving from place to place doing the same job even though they’re actually wanting to get into a different or new role. To break free from this cycle the challenge starts with your resume. How do you convey your qualifications and readiness for your next role when it is a departure from what you’re doing now? This is an issue that the Resume Project handles very well because it’s purpose is to aid you in writing about who you have been this whole time and what you are so that you then do what you are. And what you are points to a small collection of very alluring job titles simply because they make sense to your heart, head, and gut. You might be tempted to think that writing about yourself in this way is harder than what you’ve been doing. You might also be fearful of offering your trust to a process that doesn’t necessarily end up yielding anything different in the end because you perceive it as work without any guaranteed reward. I just like to remind people that it’s far from the annoyance that writing a resume is now. Not to mention that how you feel about your resume now versus how you want to feel is what’s driving the whole undertaking in the first place. Meaning that I have never seen this process not be worth someone’s while when they’re ready. An accurate resume is writing about yourself in a way that makes sense and makes peace with the satisfying as well as the dissatisfying parts of your professional past. What this meant for Karin was, that while she may have been in management instead of leadership roles until we worked together on her resume, if she possessed the ability to lead it would show in how she talked about and approached her management roles. She could have been a “leader in training” this whole time. The question is whether or not she could let go of her attachment to “wanting” to be a leader in order to see if she was a leader already from how she approached her past and present experience. Wanting to be something can greatly obscure and even sabotage what you are in your work. The ego must often be examined for its true motivations no matter how innocent it tries to convince you it is. What the story-telling exercises revealed in Karin’s bullets were the specifics of her method for a style and manner of leadership. She could see that she was a leader with a defined manner and style. Once she recognized this, she understood that “the tricky part” was in declining opportunities that offered her more of what she had already been doing and instead using her time, energy, and attention to network into a leadership role that wanted her manner and style of leadership. In re-creating her resume, Karin realized that she had had an idea about what a leader was supposed to be and it was a huge departure from who she was and ever wanted to be. This is why she struggled with resume content. She thought that she needed to become something she wasn’t and didn’t like in order to get something that she thought she wanted. Karin realized, before it was too late, that it wasn’t just a leadership role that she wanted as her next job. It was a leadership role in which her style and manner was most suitable for the job. So how did this play out in creating a refined resume design? In a word: Subtlety. We needed to work within the context of strict application guidelines one of which was to include a photograph (which is not something you would do in a North American resume unless you are in show business, for example). To do this, we positioned the photo in the letterhead area, added a graphic frame and changed the shape from square to rectangle. The font style and size was also adjusted and a small design detail helped to compartmentalize the “applicant information” section even more than what was required. Sometimes you can use “restrictions” to make the design even more useful and aesthetic. You can treat application restrictions as creative opportunities as opposed to obstructions on your path to career bliss. If you really want something, you will find a way through as part of your process because your nature is to be creative. You’ll notice too, that Karin’s header has a lot more information in it than it would for a domestic position. The need for this information needed to be accommodated for without looking “squished” – like an international and domestic address, nationality (again – not something you include for a North American resume), multiple phone numbers and email address, etc. The location of this information is dictated by the application guidelines so moving it to a different location for the “sake of creativity” would not be wise as, to a reviewer’s first glance, it would appear to be missing, or worse, it would convey that Karin was unfamiliar with the application requirements and therefore an unsuitable candidate. The tiny tweaks made to the formatting allowed the content creation to flow. Karin could begin to see herself differently so that she could talk about and write about herself differently. Keeping the exact same formatting after having changed all of the content is a bit like maintaining the same wardrobe decade after decade. Karin hasn’t used this resume yet, as far as I’m aware. She did say however that working on a resume that captured her manner, style, and method allowed her to speak about herself with greater accuracy and confidence making the most of her networking opportunities. Instead of trying to “read” and please other people, she was trying to see if there was a genuine fit. She also found herself unintentionally being more discerning and bolder about who she was connecting with. Before she said she would talk to “just anyone,” but apparently not anyone that she really wanted to work with. She had shied away from those she wanted to work with because she was lacking clarity and didn’t want to be seen as someone who wasted people’s time. Talking to “just anyone” felt frustrating because most of the time those connections weren’t actually helpful for her or them. Ironically, because of this resume process, Karin doesn’t think of just anyone as “just anyone” anymore. As someone with newfound clarity, she reported that her networking feels more purposeful. She can listen and hear others better (someone who may not have originally seemed like a useful connection becomes one as she understands both herself and them better) as well as feel more heard herself. We’ve now concluded the section on design stories for resume letterheads. Hopefully they’ve been able to help you think about the story of who you are, your desired work context, and what the best approach to your own amazing resume letterhead is. Don’t forget that you also use the letterhead for your cover letter too! Yup. Spiffy! The upcoming sections detail all you need to know for how to craft the most excellent resume bullets about yourself you’ve ever heard. Stay tuned. Download a PDF of Karin and Rebecca’s resume headers here.